Serendipity Reviews: Sunday Salon - I finally get it! Sunday Salon - I finally get it! I have been up and about early this morning, as Sunday is the best day for visiting the local boot sales and I love to go to see what books I can find. I am a little bit stiff and sore, as we spent the day at the beach yesterday and I ended up with sunburn. I had suncream on as I always do, but I still got burnt! Today I want to tell you about my happiness at finally falling into the graphic novel phenomenon that completely passed me before. I happened to be in my local library last week, perusing the Young Adult section, which is all my first port of call, whilst in there. The looks I get from the librarians always makes me giggle. Why would a married woman,with children be reading YA? They obviously haven't read any! Anyway, as I was browsing I came across this. Now I have been desperate to read Coraline since the film came out, but I have never seen it in the library, so I was really pleased to find this graphic version. It just jumped out at me, willing me to take it home and read it. It was daring me to read a graphic novel! So not to be defeated, I picked it up and took it home. I got comfy on my sofa and settled to read it. Within the hour, I had finished it and loved every word of it. It was absolutely fabulous. The story of Coraline is very dark and I think this version of the book makes it even darker. The graphics are a little gory, but I loved it. I was so taken by this book, that I was desperate to read more, but when I went back to the library, all the other graphic books seemed to be either about Batman or parts of a series. So I am asking all of you who have already been drawn into the world of graphic books if you could provide me with a list of graphic books I might enjoy reading. I can't wait to compile a list and dive into these fabulous books. PS, for any of my teaching friends reading, I would definitely recommend graphic books for your reluctant readers. They would be a superb way of encouraging children to read. So that is all from me today, but do leave a comment if you have read a brilliant graphic book that you think I would enjoy. Have you read Art Speiglmann's 'Maus' books? They are very dark - about his parents' experiences during World War II, but very good. I must try this version of 'Coraline'. I didn't get anywhere with the original. Ho ho! One that is ALREADY on my wishlist! Neil Gaiman you really can't fail with. Have you tried the League of Extraordinary Gentlemen? That's good. There was a series of 3 that's been compiled into one book that accompanied the Alice Cooper Album The Last Temptation. I had loved the album anyway but when I finally got hold of the comics - the album just took on a WHOLE new meaning. 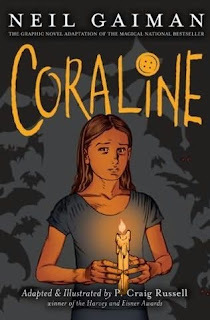 Ooh, I'd love ot read a GN version of Coraline! Some good GNs I've read: The PLAIN Janes by Cecil Castelucci, pretty much anything by Marjane Satrapi, Pedro and Me, The Trial adapted from Kafka, and We Are On Our Own by Miriam Katin. I've got a lot more on my list to read, but those ones I really liked a lot. Hey girl! Sorry about the burn, I can relate. Sunscreen or not, I will turn bright tomato red! Yay for graphic novels. I'm so excited that I gave them a chance. I'm going to piggyback on some of the recommendations already left: Maus I&II, Persepolis I & II, the PLAIN Janes, and then some that weren't mentioned but were awesome: Swallow Me Whole and Blankets. I feel your pain. I can burn through SPF 50 in an hour. Sigh. Read a great graphic novel of The Picture of Dorian Gray a few months back and was told there are more classics from this publisher - Sterling Publishing I think. But I have not checked it out yet. Love the book and movie of Coraline so think I will check out this graphic novel now. Happy reading! I sympathize with you on your sunburn. I'm very fair skinned and that happens to me all the time - with or without the sunscreen. I loved Ethel & Ernest by Raymond Briggs (of The Snowman fame)..can't believe a graphic novel actually made me cry! I didn't see anyone had mentioned The Fables series by Bill Willingham yet. I really think you'd enjoy them! And Castle Waiting by Linda Medley...one of my favorite reads of the year thus far...utterly enchanting. And of course, there's Neil Gaiman's The Sandman series, which of course are totally awesome. Oh Vivienne, you are in for such a treat! I find it hard to believe that I just read my first graphic novel a year and a half ago...now I can't possibly imagine my reading life without them! Thank you all for these fabulous suggestions. I shall have to write a post with them all in to share with everyone. I can't wait to get started. Blankets by Craig Thompson is probably my fav. Also Yossel by Joe Hubert,Y the Last Man by Brian Vaughn, Three Shadows by Cyril Pedrosa. The Invention of Hugo Cabret - not a graphic novel but a story told in stunning pics and written chapters. I picked up a Manga Shakespeare - of The Tempest the other day and was really impressed. I used The Invention of .... with my special needs group, lots of dyslexia and learning difficulties as well as behaviour issues. I had one copy, had them sat on the floor like in reception (they're 12), they were reading the images, picking up on all the things a level 5 child should be able to pick out of a text. BTW after having seen your many scrapping posts, I ended up browsing the internet for hours last night looking up scrapping and mini book making, then went and brought a few suplies today - not sure I'll be any good but fancied having a try. Katrina -wow, you have read so many. Well done on taking up scrapbooking. I feel like a terrible influence on your purse strings! I second some of the suggestions here. Both volumes of The Plain Janes are excellent. Be sure to read them in order. League of Extraordinary Gentlemen is very good. A bit adult in places but very good. The Fables series of graphic novels is amazing. I'm a big fan of the Hellboy and B.P.R.D. graphic novels. Extremely well done if you are into gothic/historical/folklore tales. And I cannot suggest enough that you go ahead and read the actual Coraline novel if you have not done so. It is wonderful. Oh, this post makes me so happy :D I've yet to read this adaptation of Coraline, but I know I'll love it when I do. Coraline is a great read. I would love to see the graphic version. I have many GN's in my media center. The kids love them. Usually they become popular in 4th and 5th grade. Some of the younger kids want to take them out, but the vocabulary is too high in most cases. Middle School kids go nuts for GN's. I'm glad you discovered this genre. I appreciate you sharing this. My daughter read Coraline when she was in 8th grade and then we listened to it together on a trip. Very fun. When the movie came out we thought it only appropriate that we go together. Loved it. I think this graphic novel would be a wonderful present for her. I tried a graphic novel last month and it didn't stick. Loving this list of recommendations though! The graphic novel area in my library is so intimidating unless you know what you're looking for! Thank you all so much for the fabulous suggestions. I shall definitely put them all into a graphic novel list to share with everyone. Yet to read it. Will pick it up this month! All of the ones I was going to mention have already been listed. I would suggest starting with The Invention of Hugo Cabret or the Maus books, but I also really liked Persepolis and the Emma series. Ouch to the sunburn! I don't burn thankfully. I have read Coraline and enjoyed it but I'm still not a graphic novel lover. I wish I was though as everyone seems to enjoy them so much. I loved reading Coraline, and this graphic version does look good.